Each of us has experienced something that left us broken and in pain. We need to recognize we are not alone-there are others who have been where we are, and God understands how we feel. We live in a broken world, but Jesus came to make us whole. In this study readers will learn how to recognize in their hearts they are children of God and made free, how to break free of the cycle of pain and not pass on the same legacy of sin and pain, how to forgive those who have wronged us and be reconciled, how to get past feelings of injustice, and how to experience joy even in the midst of suffering. 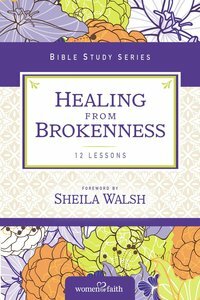 About "Healing From Brokenness (Women Of Faith Study Guide Series)"
Customer Reviews For "Healing From Brokenness (Women Of Faith Study Guide Series)"